Donald Trump has tweeted that it is “great” that many Harley-Davidson owners plan to boycott the firm as a row over tariffs escalates. The US president said “most other firms… including Harley competitors” agreed with his decision to impose tariffs on steel and aluminium imports. In June, Harley-Davidson said it would move some production out of the US to avoid retaliatory tariffs from the EU. Mr Trump has already attacked the move, threatening Harley with higher taxes. Harley-Davidson refused to comment on Mr Trump’s latest criticism, but pointed to an interview chief executive Matthew Levatich did with CNBC last month. In the interview, Mr Levatich said the firm’s preference “in all cases is to supply the world from the United States”. He said, however, that the firm had invested in international manufacturing over the past 20 years because “trade and tariff situations in certain markets” made it “prohibitive” without this investment. “We’re only doing that because these are important growth markets for the company that, without those investments, we wouldn’t have access to those customers, at any kind of reasonable price,” he said. 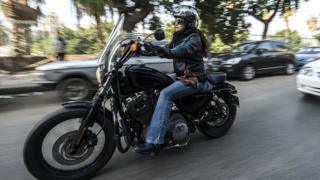 Harley-Davidson warned last month that its profit margins this year were likely to halve as trade tariffs bit. Harley-Davidson expects added costs of $45m-$50m this year, due to the EU tariffs, as well as higher aluminium and steel prices. The company said in June it would shift some motorcycle production away from the US to avoid the “substantial” burden of European Union tariffs. It has assembly plants in Australia, Brazil, India and Thailand as well as in the US, but it has not said which plant would take up the extra production. Mr Trump has said tariffs on steel and aluminium imports, which came into force this spring, are necessary to protect the US steel and aluminium industries – he maintains these are vital for national security. The tariffs have drawn retaliation from the EU, Canada, Mexico, India and others while driving up the cost of metals for manufacturers in the US. The US has also threatened to hit billions of Chinese imports with import taxes, some of which are already in effect. It is also considering tariffs on foreign cars and vehicle parts.